Drivers on Tuesday headed out for the morning rush later in the day as ice and fog lingered throughout the D.C. region. The icy conditions prompted some school systems to change from opening late to not opening at all. Here are photos of the early morning fog that hovered over the region and ice from around the area. A number of schools in Virginia opened late or closed for the day, and all public schools in Southern Maryland are closed. In Maryland, Calvert County Public Schools, Charles County Public Schools and St. Mary’s County Public Schools were going to open two hours late but changed to closed at 8 a.m. In Stafford County, Virginia, schools had planned to open late but changed to closed just after 5 a.m. due to ice on the roads. A dense fog had also descended over the D.C. region during the morning commute, prompting an advisory from the National Weather Service. The advisory expired at 9 a.m. The iciest conditions were in areas north and west of D.C. but areas in the immediate D.C. area also reported dangerous conditions on the roads, especially in Southern Maryland, including St. Mary’s County, Calvert County and Charles County. Rich Hunter in the WTOP traffic center received reports of icy conditions in other areas as well, particularly on secondary roads. 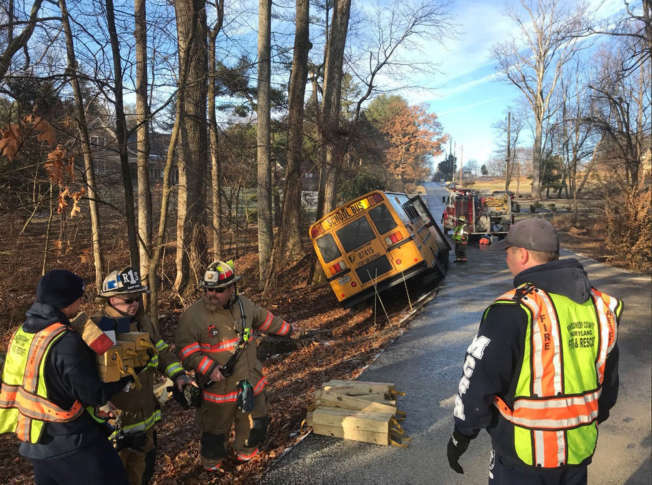 In Montgomery County, Maryland, a school bus with several passengers aboard slid off the road on Tulip Lane at around 8:45 a.m., according to Montgomery County Fire and Rescue spokesman Pete Piringer. All occupants were safely removed from the bus and no one was seriously injured. In Maryland, U.S. 301 southbound, south of Tobacco Road, was closed for several hours due to ice. A truck slid off the road earlier in the morning, WTOP’s traffic center reported. In Virginia, drivers on U.S. 29 out of Culpeper reported ice on the road. The Loudoun County Sheriff’s Office says icy patches were present on both main and secondary roads across the county, and that drivers should delay their travels until temperatures rise later in the day. In addition to ice, water main breaks also caused issues on roads in Northern Virginia. In Arlington, on the George Washington Parkway southbound, the ramp to Reagan National Airport was closed for the morning rush hour due to a water main break. In Fairfax County, Virginia, a water main break has shut down Annandale Road in both directions near Statecrest Drive. The main break may cause Metrobus delays on line 3A in both directions. No serious accidents have been reported but spinouts due to ice were being reported on Md. 4 and Md. 5. While most main roads had been treated, side roads, sidewalks, driveways and parking lots also posed a threat. WTOP listener Mike Webb said his neighborhood of Riverside Estates in Fairfax County, Virginia, was treacherous. “Walking the dogs and found all roads and sidewalks extremely, extremely slippery,” Webb said. Visit our traffic page for the latest updates, follow us on Twitter @WTOPtraffic, and listen to live traffic reports every 10 minutes on 103.5 FM or via our online stream.